Straight outta Montreal, the most European of cities in all of North America, four friends get together following a mutual meetup at a SAXON concert at Foufonnes Electriques in 2011 and begin writing songs inspired by loud guitars, fast cars, girls, tattoos and other subject material considered anathema to the critically acclaimed masses that worship at the indie rock altar of the Arcade Fire and the Dears. "Songs about being born to booze?" the neck-bearded hipster will scoff at the bandanna-wearing leather-clad tattooed quartet that make up SLEAZY WAY OUT, sensing that the band aren't massive Leonard Cohen fans by now, "Like the Confederate flag in 2015, that just won't fly these days in the scene. You sure you guys aren't a novelty act?" 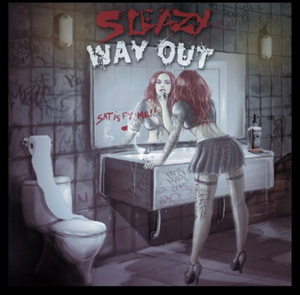 True, SLEAZY WAY OUT are indeed a band from a bygone era completely out of its element, but the only piss they're taking is from copious amounts of Bombay Gin and Budweiser amongst other sources of liquid inspiration which helped in the writing process for their full-length debut album Satisfy Me. And clearly the band members - vocalist Stacey Sleaze, guitarist Cleve, bassist Xavier and drummer Danny - have managed to curb their time at the bar enough to not only record and co-produce a decent debut CD (with the help of SLAVES ON DOPE producer Kevin Jardine) but to also oversee its distribution and promotion both at home and abroad. KNAC.COM already gives both "Born To Booze" and the title track some moderate amounts of airplay and the band have a small but steady following in Europe. "So do most other struggling indie bands," protests the hipster, "Why should I be giving these chodes more of my time instead of the profound ethereal rawness of Wolf Parade? And why hasn't Kurt Cobain come back to finish the job he set out to do back in 1991?" Well, Kurt's been quiet for the past 20 years due to him being somewhat dead and the void left by him on modern rock radio has only served to add the halcyon days of grunge onto the pile of rock classics you'd be happy to never have to listen to again. Plus almost every struggling indie band these days barely has an original sound anymore thanks to their penchant to recreate the spirit of Seattle. Isn't it time for the Eddie Vedder vocal style to be put to rest already after two decades? SLEAZY WAY OUT seem to think so as do every other new band from their 80's glam revival (CRASHDIET, CRUCIFIED BARBARA, DIEMONDS) that they've toured with. Their sound may not be entirely original either but at least they're trying something unique outside of more uninspired renditions of "Smells Like Teen Spirit". When was the last time you heard a vocalist nail the sounds of Tom Keifer's bluesy voice without having to join aCINDERELLA cover band? Frontman Stacey Sleaze gets the job done on "Wasted Chance", which is about the only moderately slow-tempo song on the whole disc. Elsewhere he'll alternate his singing style with that of DANGEROUS TOYS/BROKEN TEETH frontman Jason McMaster on tracks such as "All The Way To Heaven" and "Hotter Than Fire". As well, any RAMONES fan would appreciate SLEAZY WAY OUT's talents for writing songs between the 3-4 minute mark rife with catchy hooks. Of course, songs like "Goin' Wild" and "Rock The Groove" sound lyrically amateurish but so was 95% of the RAMONES' output as well. Okay, I don't entirely get the point behind the recorded crank calls after "Voodoo Queen" either but at least they'd be forthcoming when it comes to sharing an inside joke. Profound and ethereal kinda limits the playing field for spontaneity and straight-up fun and no amount of locally crafted beer can suddenly make Win and Regine as exciting to the masses as SLEAZY WAY OUT. You might not be able to count on SLEAZY WAY OUT to guard your locally crafted beer but at least you can count on them to put out a lively-sounding disc in the form of Satisfy Me. Grab a copy of Satisfy Me in the KNAC.COM More Store right HERE. we want to send out a huge thanx to all of the following people for spinning the tunes and "spreading the sleaze"
© 2019 Sleazy Way Out. All Rights Reserved. Powered by HostBaby.